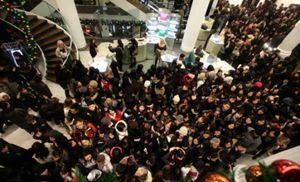 Retail industry participants are encountering intense pressure from consumers to satisfy demands that simply can't be fulfilled with traditional practices. A number of merchandisers have considered business process outsourcing and radically digitizing all facets of their operations, from inventory record-keeping to financial management. The reason why? Customers expect more of the corporations with which they interact. Companies such as Amazon have set high standards for their competitors because they've offered people what used be considered luxuries: free shipping, two-day delivery and a seemingly endless selection of goods. These amenities are now regarded as part of the deal, causing stress in back-end operations like strategic sourcing. Brick-and-mortar stores haven't been exempt from abiding by these stringent standards. According to Multichannel Merchant, a report from Forrester Consulting discovered that 71 percent of shoppers anticipate being able to view in-store inventory online, while 50 percent of them believe it's perfunctory to buy products online and pick them up in store. Although these provisions may appear to be somewhat frivolous, the marketing analysis found that 73 percent of respondents were "likely or very likely" to visit a local outlet if they could see what items were in stock on the Internet. In order to provide people with this level of transparency, it's evident that organizations require more oversight on all operations. Ultimately, a business strives to support the needs of the customers to whom it is trying to cater, so it's imperative that questions such as "What is the procurement process?" can be answered by each and every staff member. Personnel should not only understand the concept, but how the practice impacts the consumer's end of the bargain. Achieving such oversight isn't impossible. McKinsey contributors Shahar Markovitch and Paul Willmott noted that a radical overhaul of all business practices is necessary. A healthy mix of outside insight, advanced software and real-time fulfillment combined with a focus on personalization and solidifying connections with global partners can go a long way in improving the overall function of an enterprise. Furthermore, these applications will help companies meet the "unreasonable" demands of consumers. Restructuring an entire business model is no easy task, but with the appropriate technology and expert guidance, the hard work is sure to pay off in the long run. Markovitch and Willmott noted that digitization can help cut costs by up to 90 percent because the time required to process information and make decisions is significantly reduced. Not to mention, organizations will be better able to satisfy the desires of ever-critical customers.